The future of medicine has arrived. No, we’re not talking about robot surgeons, implantable memory-augmentation devices, or doctors wearing Google Glass. The game-changing innovations on this list are more than distant dreams or inventions no one really knows what to with yet. Most should be available as early as 2015. Every year, the Cleveland Clinic comes up with a list of new devices or treatments that are expected to help improve our daily lives and reduce our risks of developing disease. Only time will tell whether their considerable promise pans out. Here are the top 10 new medications, treatments, and technologies to watch for in 2015, according to the Cleveland Clinic. What if there were a drug that could lessen the brain damage caused by a stroke by targeting the blood clot that caused it and breaking it up? As it turns out, there is. It’s called tPA, and the faster it’s given after a stroke, the safer and more effective it is. Here’s the problem: Most people don’t get the drug in time, and it can only be administered via IV. Lack of access to quick treatment can have dire consequences — someone in the US dies from stroke every four minutes. Mobile stroke treatment units solve this problem by taking tPA directly to the patient. The units are essentially ambulances outfitted with everything health professionals need to treat a patient suffering from a stroke and staffed by an onboard paramedic, a critical care nurse, and a CT technologist. A broadband video link allows the onboard team to virtually contact a hospital stroke neurologist to guide treatment. Close to half the world’s population is at risk for developing dengue, a disease characterised by high fever, nausea and vomiting, and pain behind the eyes and in the muscles, bones, and joints. The virus kills some 20,000 people each year and is spread by mosquitoes. One of the biggest challenges in creating a vaccine against dengue is that it is caused by five different related, but not identical, strains. Even protection from one type will still leave you susceptible to the four other forms. But scientists have reason to be hopeful this year. A vaccine that just went through the last phase of testing was found to be 60% effective, on average, in protecting people against the disease, and 95.5% protective against the disease in its most severe form, as dengue hemorrhagic fever. While the vaccine is far from perfect, “it’s the best dengue vaccine so far,” MIT immunologist Jianzhu Chen told The Verge. The new vaccine also reduced the number of people who needed to be hospitalized by bringing down the onset of fever by 80%. Fever is one of the virus’s most potentially fatal complications, especially when it occurs in children under age 10. The vaccine is expected to be available in early 2015. 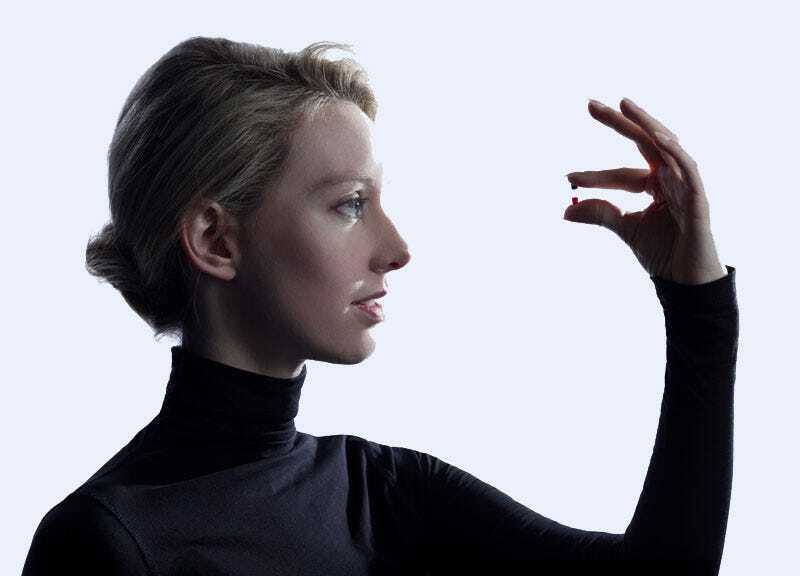 Courtesy TheranosOne-drop technology company Theranos founder Elizabeth Holmes. Instead of getting blood drawn the conventional way, a new technology will let doctors — or pharmacists, even — run hundreds of tests with a single drop of blood from a finger prick. While a standard lipid panel, one of the most common blood tests done in the US, can cost between $US10 and $US100 depending on where it’s done, the current advertised cost of the new test is $US2.99. Too much cholesterol in the blood can collect inside our arteries and plug them up, causing heart disease and death. While many people use statins, a special type of drug that can help lower cholesterol, some people’s cholesterol levels simply don’t respond to treatment. There’s a new type of injectable drug just for those patients called PCSK9. In studies, the drug has been successful at reducing cholesterol levels in people whose high cholesterol levels didn’t respond to statins. The best part? No trip to the hospital or clinic required. The drug can be injected at home, like insulin, and only requires one or two treatments a month. The FDA is expected to approve the first PCSK9 in 2015. Chemotherapy and radiation can save lives, but the intense treatment harms healthy cells in the process of taking down cancerous ones. As a result, many cancer patients experience side effects ranging from hair loss to crippling nausea and extreme fatigue. But a new class of drugs targets cancer cells and leaves healthy tissues alone. The drugs are a form of precision treatment that combines antibodies — the molecules the immune system uses to locate and stop harmful viruses — with a powerful toxin that kills a cancerous cell from within. While these drugs, called antibody-drug conjugates, won’t be a cure-all, more than 24 are in clinical trials for solid tumors and blood cancer. Some that have been designed to treat other types of cancer, including HER2-positive breast cancer and Hodgkin’s lymphoma, are already available. The first pacemaker was implanted in 1958. Since then, doctors have continued using pacemakers connected electrically to the heart via a complex system of tiny wires. Unfortunately, those wires can break or get dislodged in the body. Their insulation can also become cracked and lead to an infection. This new pacemaker is wireless, 10% of the size of a conventional pacemaker (about the size of a large vitamin), and is implanted directly in the heart — no lengthy surgery required. Doctors simply use a catheter in a leg vein to steer the device into the heart, a process that takes about 20 minutes. The lithium-battery-powered device lasts up to 7 years and is currently undergoing late stage clinical trials. It was first implanted into a patient in Ohio in February. Idiopathic Pulmonary Fibrosis is a deadly, untreatable disease whose cause remains unknown. Scar tissue builds up inside the lungs, thickening its tissues and making breathing difficult. Many people diagnosed with IPF only live another 3-5 years; more than 30,000 Americans get such a diagnosis each year. Two new drugs found to reduce scar tissue and improve lung function in patients got FDA approval in October. One appears to work by calming inflammation while the other blocks a protein that tells the lungs to make scar tissue. We don’t yet know if these drugs will work for all patients, but they’re the first that show promise in slowing the disease’s progression. Close to a quarter million people will be diagnosed with breast cancer this year, according to the American Cancer Society; 40,000 women will die from the disease. Radiation therapy, the leading treatment used to beat back the disease, can be inconvenient and expensive. As a result, some people simply stop getting treatment, according to researchers at the Cleveland Clinic. The Cleveland Clinic estimates that intraoperative radiation therapy, which would involve giving a patient a single dose of radiation after surgery to remove tumors, would cost one-fifth the sticker price of traditional radiation treatment, which can sometimes involve up to 20 doses. Nearly 55,000 people die each year when their hearts become too weak to pump blood. Today, most people at risk of heart failure treat their condition with two drugs: ACE inhibitors and beta blockers, which work by opening up the blood vessels and making it easier for the heart to push blood throughout the body. But they’re not a perfect fix. A new drug could further reduce the risk of heart failure. In a study of 8,000 patients, researchers testing the new treatment, called Angiotensin Receptor Neprilysin Inhibitor (ARNI), had to stop testing because the patients receiving the new drug had far better health outcomes than those taking traditional drugs. Compared to people taking traditional heart failure drugs, people getting ARNI were 20% less likely to be hospitalized for heart failure and 16% less likely to die from any cause during the study.